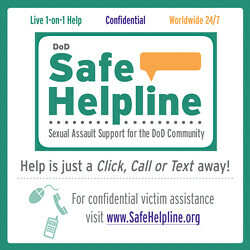 The goal of Sexual Assault Response is to provide immediate response and appropriate support for victims of sexual assault in the USNA community. Each case is treated with the utmost consideration and compassion, always with the best interest of the survivor in mind. All members of the response team, the SARCs and Victim Advocates are trained to protect confidentiality to the highest degree each individual situation allows. We are here to respond 24/7, refer to services, and facilitate recovery. We are committed to delivering care and devoted to healing. The Sexual Assault Response Coordinator (SARC) is responsible for coordinating comprehensive victim response services (tracking, reporting, advocacy and service coordination) from initial report to case disposition for midshipman, faculty and staff. The Victim Advocate (VA) provides direct victim support and case management, as well as continuously advising SAPRO’s Sexual Assault Response Coordinator (SARC) regarding best practices on response through the incumbent’s subject matter expertise.